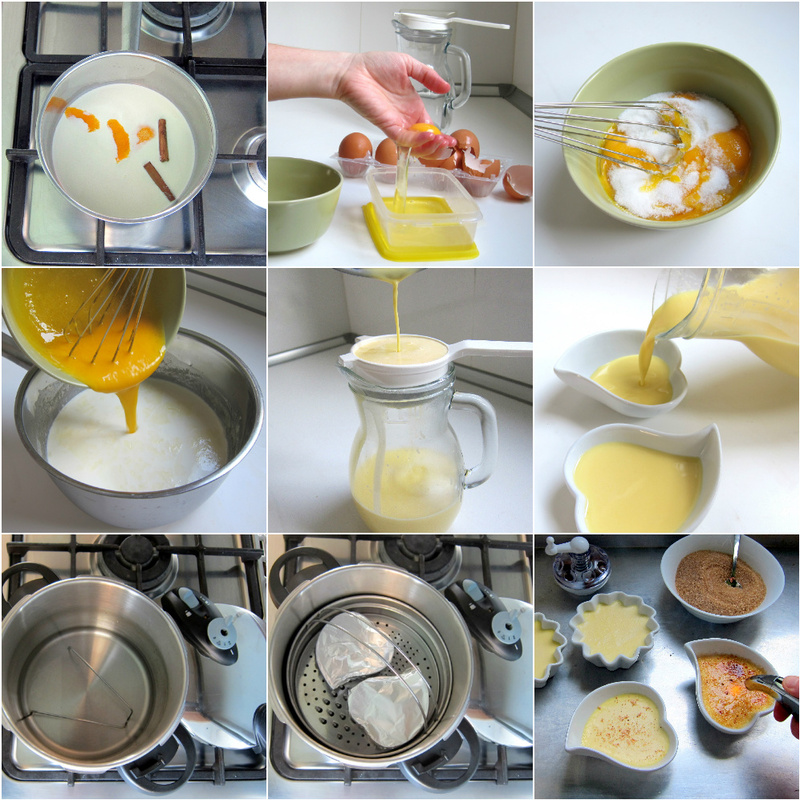 This Spanish dessert has been adapted to the pressure cooker Bain Marie method and will yield the same results as the original that has to be carefully and constantly stirred over an open flame – without any risk of curdling the eggs or worrying whether this custard will set. Spain’s Crema Catalana and France’s Creme Brulee are strikingly similar – save a few spices. Just like with the Brulee’ there can be many variations, some with all milk, some with half milk and cream, and some with just cream. In fact, this dessert is a the source of a delicious debate as to which came first and who copied the other. Typically, this dessert is served in wide, shallow earthenware cazuelas – which maximize the area to caramllize. It’s tricky, but not impossible to pressure cook these dishes – you can stack and stagger them from each other. Then, the cazuelas are carmellized with a special metal disk that is heated in a fire (or your gas burner). To save yourself the extra work and need purchase of these containers and items, you can just make this with regular ramekins or cups and with a mini kitchen torch or your broiler to create the delicious caramelized top! Don’t hold the dessert cup while caramellizing – you don’t want to burn your finger and drop the dessert! Don’t caramellize directly on your counter-top otherwise your risk scorching it as well – a metal cookie sheet is a good place to do your food torching. Put the torch away in its safe place immediately after use – they tend to look like a fun toy to kids. In the meantime, prepare your pressure cooker by adding two cups of water, and steamer basket. Set aside. Then, either melt the sugar with a culinary torch or slide them under the broiler in your oven to melt and caramellize the sugar. I am definately going to try this recipe, it looks so delicious and we tried it in Spain when we were there last year. BUT it is difficult to select all/print your recipes – can you please make them more printer friendly for us – so we can add these faves to our recipe books to work from in the kitchen? Welcome JO, I’m looking forward to hearing you you like it! It’s a little hidden – sorry I’m not ALSO a technical genius – but at the bottom of the page, under the comment box there is a green link called “print friendly” and it will let you print out the page! Hi there — This looks lovely! Do you know if it can be made in one large ramekin/dish? Just wondering what the adapted cooking time would be…. The cooking time depends on the depth of the dish. I would try a shallow dish for 15 minutes at low pressure and see if it has begun to solidify for you! I’ve got four of those eartheware cazuelas and a pressure cooker. I am so going to do this. I asked “Santa” for a torch for Christmas and I know it’s going to be under the tree. Of course, Santa has personal reasons to see too it that it is there as Santa likes creme brulee too. Thanks for the directions and the recipe. So glad Santa has vested interest! Be sure to do a “dry fit” first to see how you can get the cazuelas to fit in the pressure cooker. You can’t stack them directly one on top of the other because the top and bottom ones will be more cooked than the middle ones. You will have to try to get each one about the same area of exposure to the steam AND keep them straight. Anyway, play with your pressure cooker a bit to see how that is BEFORE you have an egg and milk mixture waiting at room temperature! Can this be adapted to use milk, so it will be a little more healthy? Anonymous, you can do the base of the Creme Caramel (it’s a little lower fat) and then use the sugar topping of the Brulee’. It will be less “creamy” and more “puddingy”. can this be done without the steamer basket? You don’t need a steamer basket but you need something to keep the custards out of the super-heated water otherwise the eggs in the containers will overheat and you will get a frittata instead of a creamy custard. Such a creative idea. I would have never thought you could make creme brulee in a pressure cooker. Barbara, almost any custard recipe is fair game and comes out perfectly smooth! Leave me a note to let me know which recipes you decide to try. Crema catalana is made with whole milk, not Cream! And it needs corn starch! Gaby, there are lots of variations. Using milk and corn starch is another variation – please share a link to the recipe you use for those who would like to try it. Traditionally, at least, there aren’t many variations. Medium high heat, mixing constantly until it thickens and not allowing the mixture to boil boil… Fish the cinnamon stick and the lemon peel. Transfer to the shallow cazuelas. Allow to cool down and sprinkle with white sugar. Lastly the sugar is caramelized with a very hot iron. Not a torch like with creme brûlée. I use a cast iron mini pot that fits the diameter. The result is like a glass! Really, you’ll notice the difference. What size ramikens did you use for this? Thank you! 6 oz. Happy Valentine’s Day! Where did you get those awesome heart-shaped dishes? Thanks Sally, I got the at the Euroshop – it’s equivalent to the American Dollar Store! OMG – didn’t realize you responded so long ago (got no notification). Thanks for the info. I have searched high and low for those dishes to no avail. Sigh. I love them! Anyway…I finally tried your recipe and it turned out absolutely perfect the first time and was a big hit. What a fun variation on creme brulee. The orange and spice flavors are divine! This was the first time I got creme brulee to turn out right in my pressure cooker. Thanks! This couldn’t be a crema catalana which is made with milk, not cream. It needs corn starch to thicken and it needs to thicken outside the container. I suggest you call this a cinnamon Creme Brulee. Thanks Gabriela, I don’t know where I was inspired originally but it was clearly not a good source!! I will look into updating the recipe and making a real Crema Catalana under pressure (if it’s possible).